My kids are five years apart, ages 8 and 3, so of course they have different interests and abilities. But I have discovered that I can pack a travel busy bag that captures the interest of both my elementary age daughter, Ella and preschool age son, John. These ten busy bag items are lightweight, fit easily in a quart sized Ziploc bag, and cost under $50 (only $45.54 at Amazon when this post was published) to purchase all of it new. (You likely have several of these items around the house, so you might not need to buy the entire list.) I’m sharing this list with you as I realized today that I don’t need to pack completely different bags to entertain my preschool and elementary age kids. These items appeal to both of them, and will likely appeal to most kids aged 3-12. Disclaimer: Amazon prices change often, both up and down. Double check the price at checkout. This is one of my favorite recent finds. It’s definitely the most bang for your buck. This pack includes 6 foam items: Alphabet puzzle, 4 shape puzzles, shapes for stringing (from the puzzles), 4 Lacing Shapes with shoelaces, and 25 piece “locktagon” construction pieces. I bought this with my three-year old, John, in mind, and actually my eight year old, Ella plays with these items the most. The “locktagon” construction pieces are Ella’s favorite. They are still a little difficult for John to work with. He likes the shape puzzles the best. 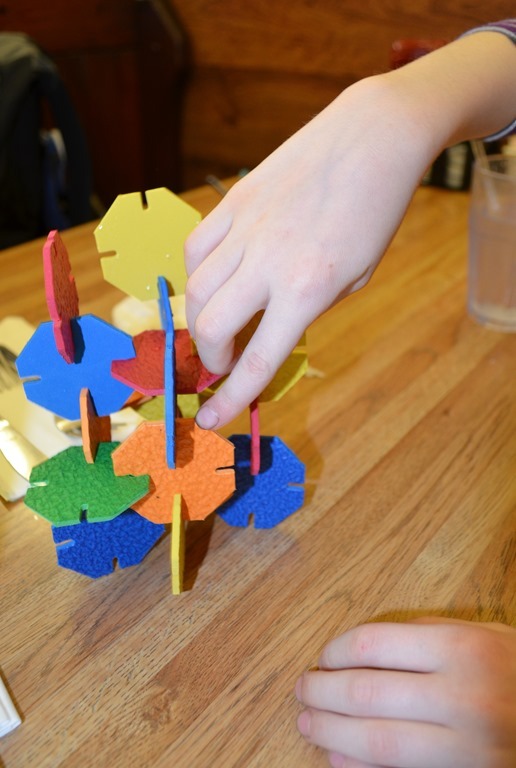 Both kids enjoy the lacing cards and stringing the shapes. I don’t travel with the alphabet puzzle since there are so many small pieces to keep in place. So this little pack gives me 4 activities with which to occupy the kids. Love it! My kids, especially sensory-seeking Ella, love doing scratch art. I love the Scratch Art books, but they are hard cover books and the weight of them adds up fast in a travel bag. I found these 4×4 scratch art note cards and just bought some myself. You can just add 10 or so to your busy bag and they are great for drawing, notes, or even just scribbling! There are no rules for how you use scratch art. Ella actually enjoys scratching off the entire sheet to reveal the rainbow of colors beneath the black area. This activity provides a deep-pressure sensation, which really helps calm the nervous system. For more activities that provide this “heavy work” (aka “proprioceptive input) when traveling, see this post: Ways to Help Your Child Be Calm on a Plane. I don’t need to explain how to use markers of course. Haha! But I love these Crayola Pip Squeaks Markers for their small size. These are the “fat” markers, which are easier for the preschool age kids to grip. This pack is a great deal at only $3.92. Cover auto-flush sensor on toilets (as described here). Cover the reading light that is inoperative and shining in your eyes on the plane. Make cue cards to let your child know what to expect throughout the day. These are just a few ideas to get you started. Let me know in the comments the creative ways you have used Post-It Notes when traveling! The opportunities are endless with Wikki Stix, which are thin, moldable sticks of wax. You can make all kinds of designs with them, practice forming letters and shapes, roll them in balls…all kinds of things! If you pack more than about 24 then they do get pretty heavy. I recommend this rainbow pack of 24 sticks. At only $5.94 it’s a great item to add to any busy bag. I like dry erase boards since you can erase and redesign anything and you’re not wasting paper. Kids of all ages enjoy drawing on dry erase boards. Since the markers glide more easily than on paper, it just provides a different experience than coloring on paper. You could definitely opt for either markers and paper or dry erase markers and dry erase boards, but I find it’s useful to have both, just for variety. If your kids are extra proud of their artwork and want to save it, just take a picture! If you’re like me, you already have a lot of dry erase boards that are small enough for travel. I like to make sure these are small enough to fit in the Quart-sized Ziploc bag I use for my busy bag. I often find small dry erase board at the Target Dollar Spot. If you don’t have any, you can get some of these dry erase self-adhesive sheets and cut them to the size you want. I would make them about 6”x 5” if you want them to fit in a Quart sized bag. You can attach them to a thin piece of cardboard to make them sturdy, or just leave the backing on them. Low Odor: A must for the airplane and for kids’ use. Mini: I love that these are small, better for fitting in my small busy bag. Eraser in cap: Keeps hands clean. My kids will use their hands to erase if the eraser isn’t nearby. Magnetic: IF you have a magnetic board, this is quite useful. I didn’t list a magnetic dry erase board here as I was trying to suggest items at a lower cost. But we have several small magnetic dry-erase boards at home, and maybe you do too. If you leave out the alphabet puzzle, all of these items will fit in a quart sized Ziploc bag. 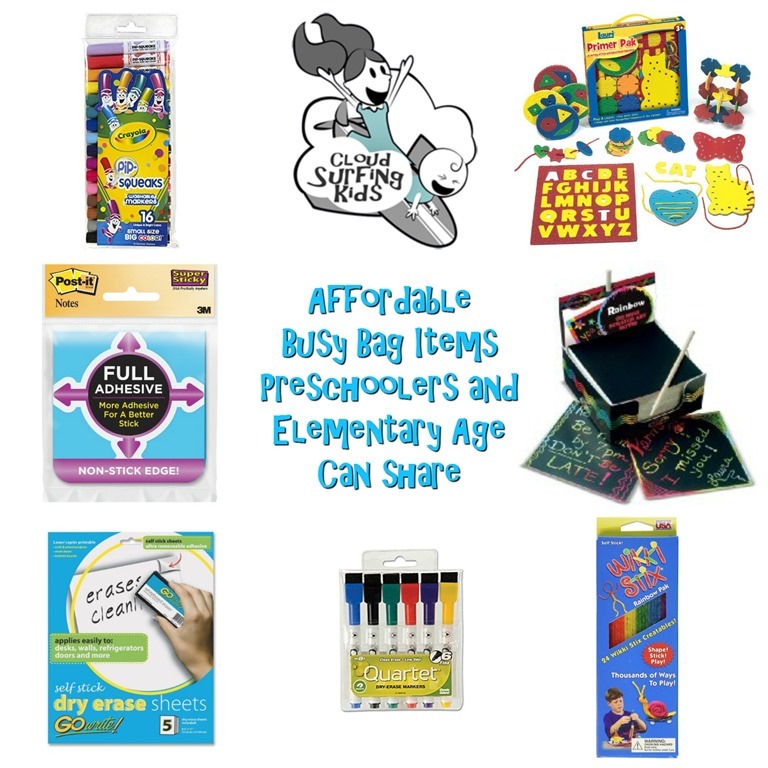 They also are all items that appeal to both preschoolers and elementary age children. The total cost if you purchase all of them is only $45.54, and you will find free shipping with Amazon Prime on most of the items I’ve listed. You’ll also have extras of everything, for re-supplying your busy bag after the trip. What ages are your kids? Do you think they would enjoy these items when traveling? What other items would you add? Comment below to let us know!